Several months ago I did a review of “The Daily DX“, and now it is time to do a review of “DX World“. One is for pay, and one, (DX World), is free. Yes, free, “DX World” is totally free to the user. I did not want to do a review without having actually used DX World for a bit, so I started using DX World on a daily basis the day I did the review of Daily DX. One service does not supplant the other service, (there is some overlap), in fact having both gives the DXer a more full view of what is happening DX wise in his or her world. I was a bit worried that DX World would just be a rehash of old postings, etc. It is not, it contains the latest news on DXpeditions, and QSL information. If you are looking for a way to compare DX World, and Daily DX, there is no real way, each is different, and each is unique. So I won’t try and compare them, so on to the review of DX World. “DX World” feels like it is your friend, you want to have it over for dinner and a drink. DX World comes with photos of the locations you talk, (or try), too, and sometimes interviews with the operators, sometimes not. Mostly DX World has a lot of good information. “DX World” feels friendly because I suspect the author is friendly, and it reflects his personality a bit, as I said, you will want it over for dinner. That said, DX World contains a wealth of information for the avid or casual DXer. It appears that “DX World” started in what looks like 2009, with the first post available to the general public, at least that is what the web site has as the first issue. Overall “DX World” come across as a well thought out, very friendly, almost live, and very useful DX magazine. “DX World” is broken into sections, and is sort of a running blog on the DX community itself as well. Sometimes , and what is current. Sometimes DX World will even give you history, which is fascinating. The first section in “DX World”, is the “DX World Weekly Bulletin”. 3B8, MAURITIUS Jose, EA5IDQ will be active as 3B8/call between May 10 and May 18. Active from 40 to 10 meter using SSB and RTTY. QSL via homecall, direct or bureau. The above section covers all the new DX that will be coming up shortly in text form. As can be seen, a lot of information is available to the DXer. Following the “Coming Soon” section is the IOTA section, which covers all of the same information above, only for IOTA stations. If you do IOTA, then this is very handy for getting the latest operations information. After the IOTA section comes the Images section, which has images of the various DXpeditions in it. This always brings home the fact you are talking to real people, not just someone with a call sign, who you send 599 too. It lets you get a feel for the operator you talk to, see a bit of his or her station, and maybe even see some of the place this person lives. Following the Images section, is my favorite, the “Daily DX Timeline”. 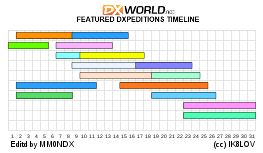 The DX Timeline shows each station graphically as a block in a timeline chart, see the example to the left. You left click the colored block representing the DX entity you are interested in to get specifics on that stations operation. Time is across the horizontal axis, and the different DX stations are running vertically. This is a very nice way to represent upcoming activities, and makes it easy to see who to work next, and to collect QSL info, etc. I particularly like this method of displaying the upcoming events, as it lets me just pick an operation and then see what is happening with that operation quickly. This sort of information is invaluable in finding a DX station, and being able to work him or her. The links are active in the Bulletin, meaning you can click them and go to the web page of the operation in question. This section is used for planning your next weeks operations and how to best get contact with a DX station. Once you have contact, QSL info is also included for most entries. The Weekly DX Bulletin clearly is a labor of love for the publisher, he must spend vast amounts of time collecting and collating most of this information into this format. All of the above is just the weekly bulletin published, within the Web Site itself. The DX Bulletin is not small, this weeks was eleven pages long, so that will give you a bit of an idea just how much information is really there! Each section is a subsection of the data placed in the entire blog, so this is an easy way to get just the information you are looking for and avoid the work of reading through literally hundreds of info snippets.. I like the site very much, and use it weekly if not daily. About the only thing I can find to gripe about is the site, (and I am reaching here), is that is does not allow me to get the “Weekly DX Bulletin”, in my email automatically. I did not look at the site for years because of this. I probably should have, and it was my loss, but it really bothers me that it can’t be delivered via email, or if it can be delivered, the process is so difficult to locate I can’t find how. As per ON9CFG, all funding received from companies, or individuals goes to sponsoring DXpedition and IOTA activities. All in all this is an amazing resource for DXing, and it is free to us, something you don’t find much now days, something free and useful, and it helps put more DXpeditions on the air as well! I encourage you to visit the site... You won’t be disappointed.